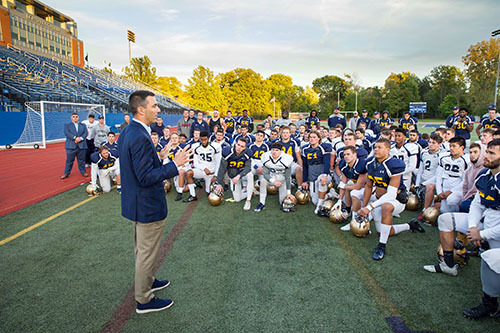 After his Los Angeles Chargers took on the Cleveland Browns this weekend, general manager Tom Telesco ’95 visited John Carroll University on Tuesday evening, sharing stories and advice from his life and career in football. Telesco then attended football practice at Don Shula Stadium, spoke with the team, and even received his favorite local pizza as a gift from the Blue Streaks’ offensive linemen. 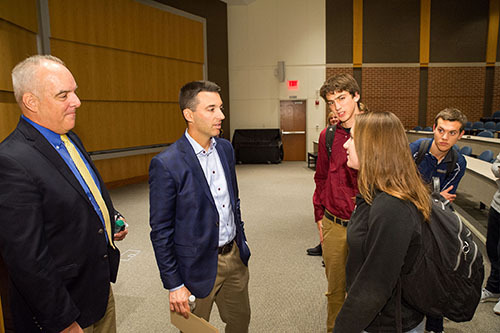 The event, hosted by the Mike Cleary Program in Sports Studies, was attended by a capacity crowd of students in Donahue Auditorium. Telesco’s career in the NFL spans more than 20 years. 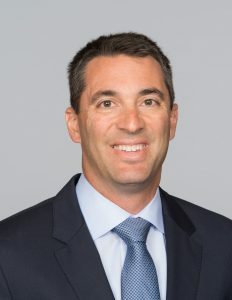 He became the youngest general manager in the history of the Chargers in 2013, capping off a two-decade rise through the NFL ranks. His NFL journey began with an internship with the Buffalo Bills, followed by scouting positions with the Carolina Panthers and Indianapolis Colts. Over 15 seasons, he would climb up the ladder of the Colts organization, eventually becoming vice president of football operations. His tenure was marked by two Super Bowl appearances including a victory in Super Bowl 41 over the Chicago Bears. The Mike Cleary Program in Sports Studies was established in 2014, through the generosity of Mike Cleary ’56 and his family. Cleary was the executive director of the National Association of Collegiate Directors of Athletics (NACDA) for more than four decades. The Mike Cleary Program offers courses in athletics administration, business, communications, ethics in sports, exercise science, and sports psychology, as well as multiple tracks of specialization. 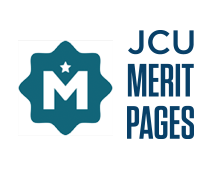 To learn more about the opportunities offered in the Cleary Program, visit jcu.edu/sportsstudies.